Davis Controls as the new representative for ABB Measurement Products in the Province of Ontario. 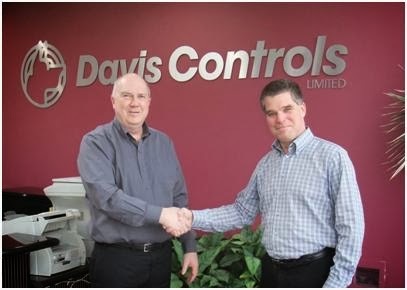 Davis Controls Ltd. was founded in 1933 and has been servicing and supporting the Factory and Process Automation marketplace in Canada during this time. Davis Controls combines technical and process expertise and dedication to customer service to provide the best solutions and products. ABB Measurement Products offers instrumentation and analytical solutions to enable industrial and energy customers to operate more efficiently and profitably. Key product groups include Analytical Instruments, Field Devices, Flow Measurement, Level Measurement and Instrumentation Service. Neil Montgomery and Paul Chabot – National Sales & Marketing Director - Measurement Products - shake hands after the agreement is signed.